The Mosaic device that is supposed to make multi-color 3D printing possible on a 3D printers with a single extruder is set to be finalized in early 2015 according to the latest updates from the Mosaic Manufacturing team. The device itself will hopefully most likely start shipping to customers later in the year if everything goes as planned. – We will be releasing our first product in early 2015. – This product will have more than two inputs, and be much smaller than the black box featured on our website. – After finalizing the build, we will be going through an optimization/testing phase, and then start a crowdsourcing campaign to launch our product. – Our goal is to have all of this complete in the first quarter of 2015. We are looking forward to getting a Mosaic upgrade for our MakerBot Replicator 2 3D printer that has just a single extruder, so it is the perfect candidate to get a multi-color and material printing capabilities thanks to this device. It is nice that we are also going to be getting a product capable of using more than just two colors as this can make it more functional as well as an interesting option for upgrade even for dual extruder 3D printers giving them the ability to print easily with more than just two colors. Unfortunately there is still no information about the expected end user price of the Mosaic device. With FDM/FFF printers extruding thermoplastic you normally need to have multiple extruders in order to be able to print with multiple colors or materials that all build a single 3D object. If you have just a single extruder you might still be able to print in multiple colors, but the complexity of the printed part should not be that high as you will have to change the filament when a new color is needed. So normally dual extruder printers are the next level of devices that offer wider functionality as they are easy to use with dual color printing or for use with a different material that will be used for printing support material so that it can easily be dissolved for example as a way of removing from the main print. 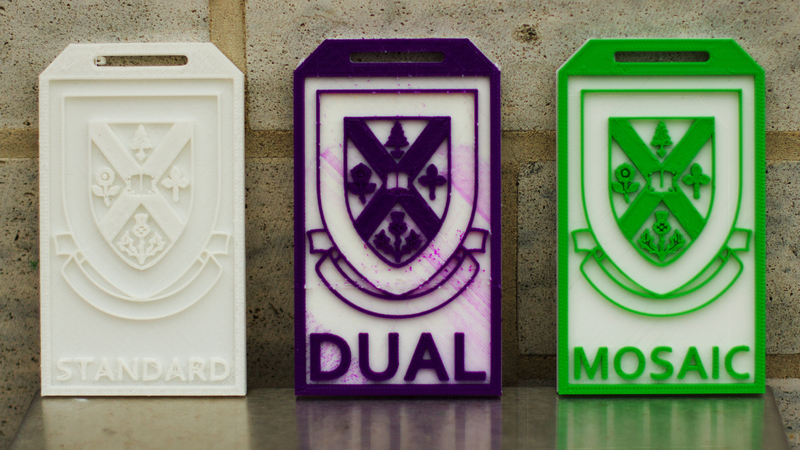 There is however an interesting new solution being worked on at the moment that should allow multi-color printing with a single extruder 3D printer by a Canadian company called Mosaic Manufacturing. What their device called Mosaic does is to have multiple filaments as input and a single filament as output by using SEEM Technology or Series Enabled Extrusion of Material. What the Mosaic essentially does is to slice the model you want to 3D print and fuse the multiple input filament colors into a single filament with different colored segments that are fed to the 3D printer and thus the printer creates the 3D print with multiple colors from a single extruder. The demo shown on the developer’s website is with two colors, but the technology should be capable of using even more, provided that it does not make the device too expensive. The Mosaic should be affordable way to upgrade your single extruder filament to a multi-color printing device, so it should not cost as much as a dual extruder 3D printer in order for the users to actually choose it. We are going to keep an eye on the development of the Mosaic devices as it is a really interesting product for owners of single extruder 3D printers that would want to extend the functionality of their thermoplastic extruders. The device should be capable of working with standard filaments (we assume that these are ABS and PLA) and with printers that run on G-Code/X3G. 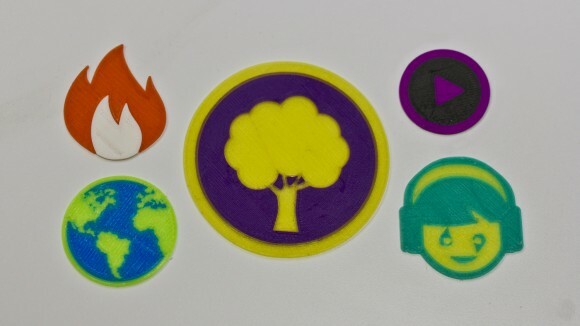 What is the most significant advantage of using a single extruder and single filament with multiple colors is that you should be getting a continuous print, which leaves no opportunity for dripping or oozing, meaning a cleaner and crispier print than when relying on multiple extruders. Unfortunately there is still no information on when we can expect to see the Mosaic device available for order and what will be the expected price, but it will most likely take a few more months at least.